"I had a bad August. 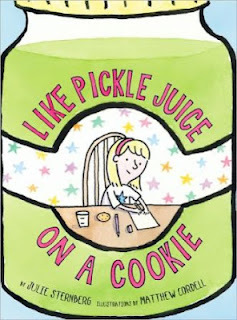 As bad as pickle juice on a cookie. As bad as a spiderweb on your leg. As bad as the black parts of a banana. I hope your August was better. 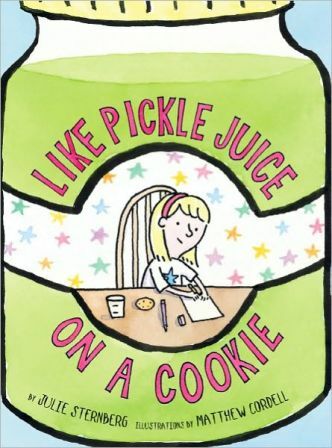 So begins Julie Sternberg's sweet Like Pickle Juice on a Cookie. Eleanor's beloved first babysitter, Bibi, has moved to Florida, and she is preparing to start the third grade. These changes are overwhelming and make our charming narrator uncomfortable. Fortunately, Eleanor is surrounded by adults who take her feelings seriously. From her parents to Val the mail carrier to her new teacher, Eleanor is respected in a way that I wish for all children. My favorite character is her new babysitter, Natalie, who understands Eleanor and grows to be loved by the girl in her own way. Written in verse, it would be a good introduction to the genre for young readers. It is the youngest-skewing and least traditionally poetic novel in verse I've read, but the tangibility of Sternberg's writing broadens the appeal to developing readers. Matthew Cordell's appealing illustrations draw the reader in to Eleanor's finely developed world. Share this book with the early elementary students in your life.